Once upon a Tooth Fairy - The tale is alive in our household! It wiggled and jiggled for some time before Jazz's gums surrendered 2 bottom incisors to the tooth fairy. New milestone, all within a week. Too fast and too quick for tooth fairy to be ready for it. Oh well, you know, I know who's the acting tooth fairy. Like the tale of Santa Claus, I didn't burst her whimsical bubble of the tooth fairy. With put together childlike faith. 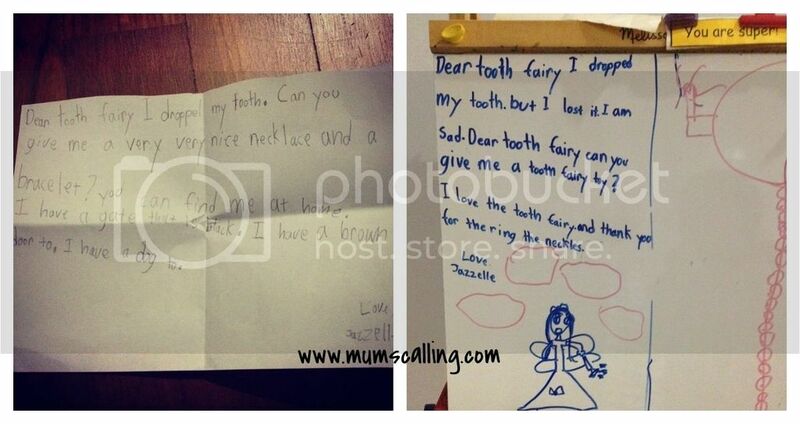 She wrote 2 letters to the tooth fairy, and chucked them tenderly under her pillow. I didn't solicit her to write those letters, it was acted upon a story her teacher shared in school. I read them with much unwillingness to burst that bubble. Letter 1 reads, "Dear tooth fairy, I dropped my tooth. Can you give me a very very nice necklace and a bracelet? You can find me at home. I have a gate that is black. I have a brown door to. I have a dog to." Letter 2 reads, "Dear tooth fairy I dropped my tooth, but I lost it. I am sad. Dear tooth fairy can you give me a tooth fairy toy? I love the tooth fairy, and thank you for the ring the neckles." Subsequently, she transferred the second note onto paper. She was really upset about misplacing her tooth in school on the second occasion. Although tooth fairy did mention she needs to collect all old teeth to fairy land, fairies can be kind in nature too. Desires granted, a magical experience came through for both! 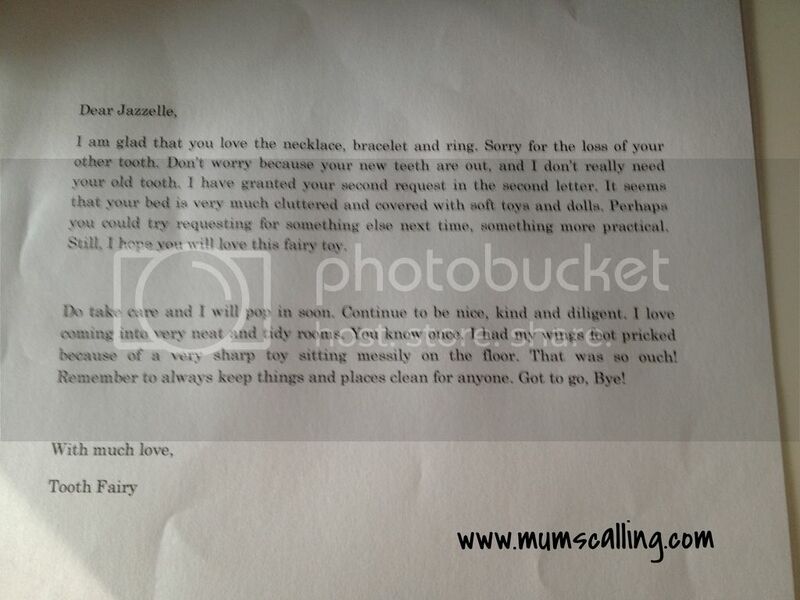 She received a tooth fairy toy in respond to her second letter. After some high and low searches, this was the closest I could get. A girly doll with wings equates a fairy isn't it? She was so excited and in all belief, shared these magical encounters with her teachers and friends. While some friends said, it was her Daddy and Mummy, a few others concurred her thoughts. Oh yes, her teachers played along with us. On the nay-believers, I left her thinking on how firmed her thoughts were. It's kind of astonishing to get myself involved in yet another classic tale. Is this something you would play along too? Upon reading her second letter, I thought I should try to achieve something good out of this adventure. I decided to leave her a reply. In the gist of my letter, on the capacity of the Tooth Fairy, comforted her on misplacing that lost tooth and highlighted that she could try requesting for more practical gifts next time (self inflicted headaches, I know). And that the Tooth Fairy loves coming into very neat and tidy rooms. Hopefully, this spurred some get together acts on tidying her room often. We should have video-ed her excitements and surprises this far. All too memorable. It was some fun adventures we've been in. Would you please not laugh at us. I know it feels silly, but for some funny reasons, I'm enjoying this little part of childhood to sprinkle that extra joy and smiles in her growing up. I know, I won't be ready to confess anything, until I have to. But wait, I might fall into my own trap in future. Will she be upset to discover that Mummy had been playing the imaginary roles?!! While time tells, I'll just treasure these magical moments that only a little kid gets to enjoy. What's one way to take time-off from your parenting fatigue? On cash rich days, I would love to say shopping! Online shopping works specially fine with me. So much so that I think only debt can do us apart. Being very careful on that though. 1. Free returns! It’s often easy to admire what drapes on stunning slim tall models, but when bought, it just doesn’t make the cut on us. Mothers do have quite abit of changed body eh? Hassle Free return is definitely a look out for. 2. Free delivery! It’s always nice to shop with low minimum amount for free delivery. Attainable such that you don’t have to burn your pocket or feel obliged to chalk up that easy amount. 3. Variety! It saves me much time and effort to find a one stop to shop all wants. Shopping is often not a necessity, such that I hardly get time for it. And, if I had the time to finally get online to shop, I would love to have the variety to view my interests at a go. 4. Discount! Mastercard Promotions is one you have to make great use of. From now till December 2015, it’s giving you 7% discount storewide at Zalora. So remember Thursdays, remember Mastercard and remember online shopping at Zalora! Like some say, it's a talent to be at the right place and right time for sale. Get ready, get online and shop! Disclaimer: This post is a collaboration with Zalora. All opinions are solely ours. The 6th Affordable art fair will be on stand this coming weekend - 17 to 19 Apr, at F1 Pit building! The part of me that's been living under a rock had never seen or heard about it. To begin with, there's no arty farty genes in our family. Naturally, art fairs had never been in mind. This year, they are back with 70 galleries offering new and fresh works. Joining in the galleries, there will be a showcase of a SG50 charity Feature Wall with selected artworks from 50 artists at only $500. 50% of the monies raised will go towards their charity partner, Playeum, while the other 50% will go back to the artist. They will also be launching a brand new night named ‘AAFter Glow Evening’, so be sure to come down and unwind on this special Friday night! While we confessed to be the least arty people around, we thought this weekend will be a good opportunity to open up those eyes to greater appreciate various art forms. Whether you are a seasoned collector, a new enthusiast for the arts or just art viewing, this will be an educational and interactive experience to fall in love with. 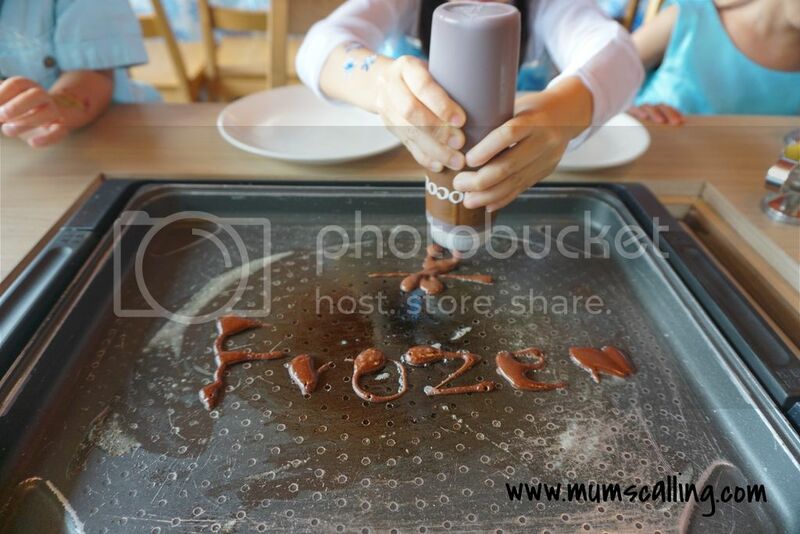 For the parenting part in us, here are some highlight of kids' activities. Little ones get entertained, while parents go art viewing. While play and fun are easy exposures, art fairs may not be an often come by to boost inspirations in little ones. The Children's art studio provides interactive free fun filled inspiring activities for children of all ages. Playeum invites children to be inspired by the works of ceramic artist Madhvi Subrahmanian and spend a clay-play session centered around the theme – “Our home in the rainforest”. Participants will have the opportunity to create clay sculptures based on their own imagination, and together will build a rainforest landscape inspired by ripples, raindrops, rain-trees and houses. The installation will grow little by little into a large organic representation of “Our home in the rainforest” with forms reflecting the environment we live in. As part of these activities, complimentary children’s activity booklets will be filled with a range of arty fun activities to help children discover their natural talents in new ways! Children receive these upon arrival (limited quantities available). Fun for all ages. On entry to the Fair, visitors can leave their own artistic mark on a bright pink Elephant and instagram themselves for a chance to win their own Elephant Parade Art Box. Within the Fair, visitors can discover more about Elephant Parade and their conservation projects as well as learning how an artistic sketch is brought life as a full size Elephant. Throughout the Fair, visitors can even have a go themselves by creating their own 2D design for an elephant, or take up the opportunity to join Elephant Parade for their daily 3D workshops (Limited quantities) to bring their designs to life on a mini elephant. For the guide to newbies in art buying, here's one guide I find most useful. It all begins with finding a piece of wall that had been left blank far too long. 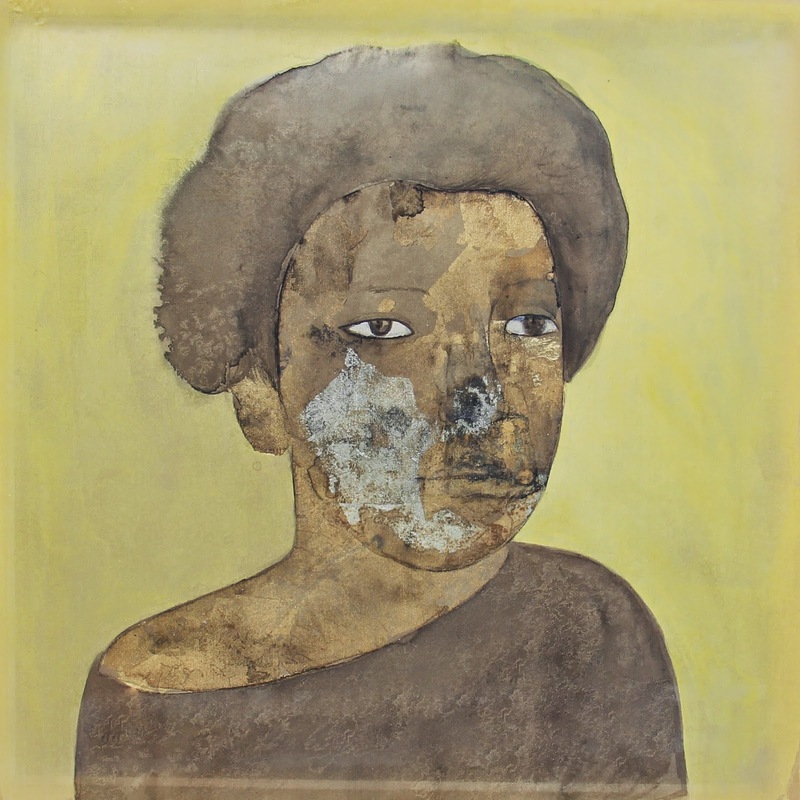 One of the exhibitors taking part in the fair this weekend includes Fun Art. Along with them are 2 very talented artists. Here are some teasers to release the art appreciation in us. Artist Liu Aijing, uses unconventional materials and methods to create her art along with her specialty Chinese ink. 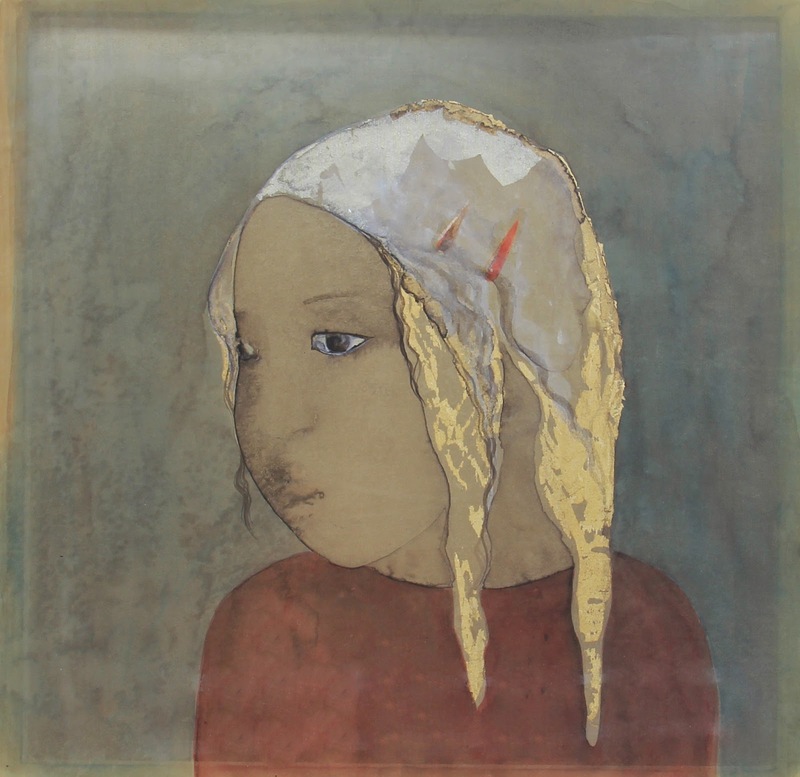 Her experimentation with medium and materials such as silk, tinsel, soil and mineral pigments, and methods such as oxidization has led to the creation of her signature style of paintings that deliver an aura of mystic and ethereality. Perhaps these images are merely fragments of memories or perhaps they are to convey the transience of life and beings. Liu Aijing, Baby series 1, 2014. Liu Aijing, Baby series 5, 2014. In the thoughts of the Artist, "Baby is an extension of an ongoing theme. Every one of them is an independent character; some melancholic, some mischievous, some expressionless and some look lost. They are real people, living in the moment and living amongst us. At all times, they struggle between reality and dreams, yearning to own all that they desire or striving to pave the way to a better future. They want to live life their way, no matter how distant their dreams may be." The second artist is a contemporary Chinese ink artist Ding Wenqing, who is conceptually strong and skillful. Given the increase popularity of contemporary chines ink to the Chinese art market. His works might be on interest to many. Ding Wenqing, In a Glass No.2, 2013. 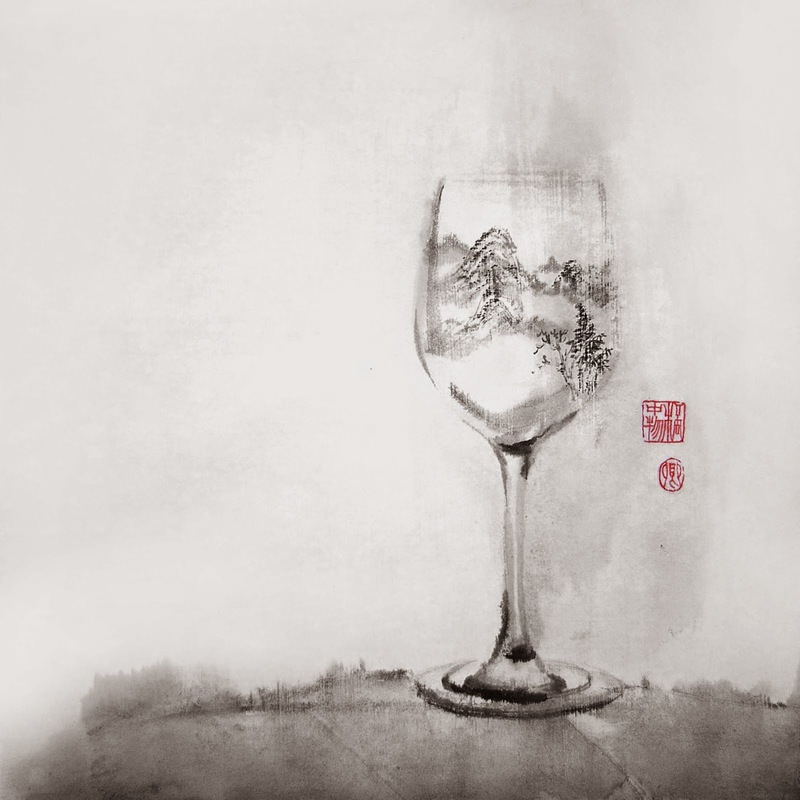 In his In a Glass series, he confines Chinese (山水）Shanshui landscape in a modern day glass, be it a wine glass or a rocks glass. In the past, the elite literati had a culture of winebibbing while composing poems inspired by natural landscapes, releasing suppressed emotions and at times, reflecting upon failed personal ambitions and the political state of affairs. Already sounding like there's so much to a piece of art eh? Much stories lie within each piece. These pictures are definitely not doing itself justice by virtual viewing, you'll need to get near it for the live and actual. Seeing is believing! Fun Art asia has offered Mum's calling 20 pairs of tickets to our readers. 2 pairs per family (That is 10 fastest fingers!) Children below 16 enter free. Tickets will give access to the AAFter Glow Evening Party on Friday (17th Apr), as well as throughout Fri to Sun (18th to 19th). All you need to do, is ensure that you are a fan of Mum's calling facebook and be the first 10 to leave your interest on this Facebook page. Just mentioned "I'm keen to go!" and I'll confirm with a reply for further information. Fun Art will require your mailing address to mail you the tickets. Disclaimer: We were given tickets to the fair in exchange for this blurb. All opinions are solely ours and photos credited to Fun Art. The Frozen fever did not subside. Jazz is still very much into Let it go and needless to say, that became her birthday party theme last weekend. Her wish became my command. In shades of blue, white and purple (not forgetting Anna), I had the theme done up at her party. It wasn't too difficult as I love party planning. Sometimes it dreads, but there's quite some fun within. Oh well, who else better deserve my time other than my loved ones. We held her party at slappy cakes, The Grandstand. We thought it's a lovely place that's of good suit for her age group of friends (5 to 6 year old). Little siblings blended very well too. I brought in our decorations, did up a barely passable dessert table and brought in some entertainers, a magician and a glitter artist. Jazz had always love magic, and requested to have one at her party. We're glad to have made it happen. 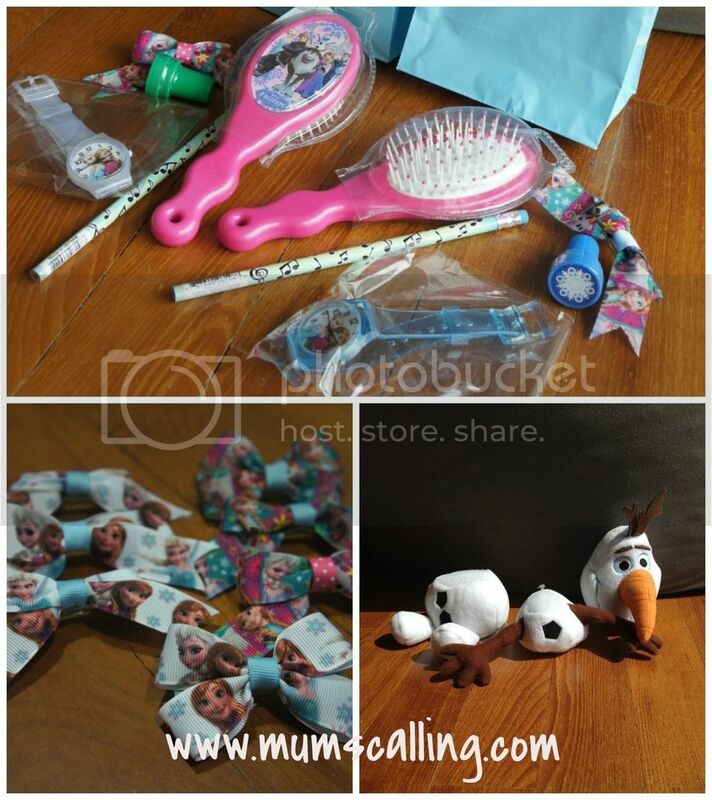 I Google and searched for frozen party printable. DIY-ed a banner and some paper tiaras. Here's one you can use. Print them on an A4 sized paper, punch 2 holes, 1 on each end and run a chiffon ribbon through the hole. Triple tie knots to prevent the ribbon from running through. And nope, paper disposable tiaras did not disappoint any girls. In fact, I have much of these leftovers. 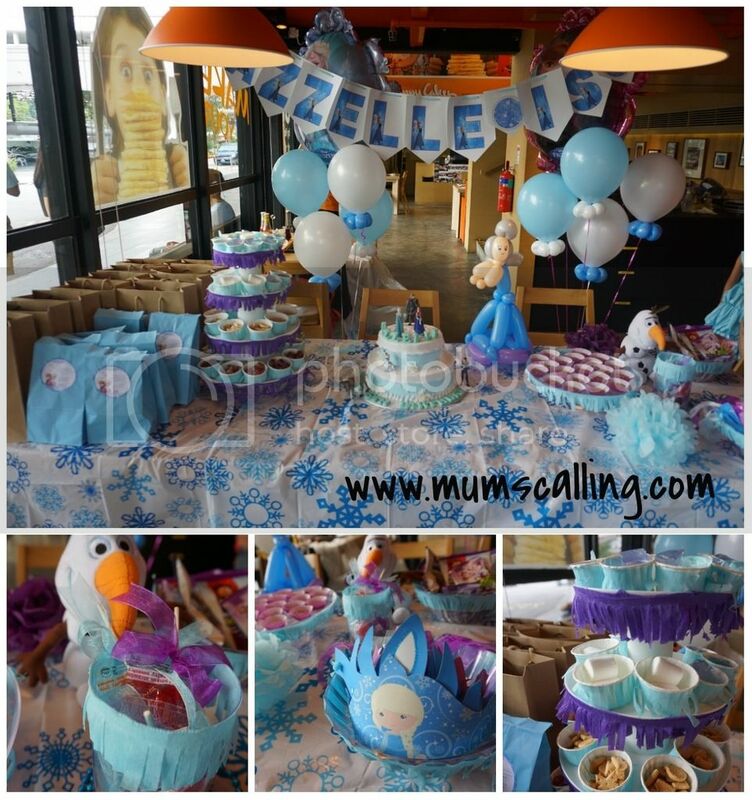 Drop me a pm if you're planning an upcoming frozen party. I can mail them to you. About 12 of them. We always have this 4 tier cupcake holder, invested when we were in the states. It had always been whipped out for parties. All I needed to do was don it to the theme with coloured tissues. I had Jelly, marshmallows, crackers and grapes sitting pretty on it. At another side, we had lollies with chiffon ribbon tied to it and chocolates to further elevate a happy mood. And of course, balloons! We used her airbrush service previously for Jare's birthday. Found out that she has sparkly glitter art, and we decided it will wow the kids! She was one entertainer the kids love. Boys and girls would take turns to flock to her for their piece of art. I had thought it would be messy with semi-dried glitter on active kids. To my surprise, it didn't take very long for it to set dry. With Nicole's good range of stencils and colours, it made the kids really happy! She was so occupied that I couldn't find time to slot myself in. Thanks for making the kids beaming with smile, Nicole! I had say it's a little of fate to have come by Jason. If you read about our party postponement previously, you would have known he wasn't our first choice. I had google, finely shortlisted and selected before confirming him. I'm apprehensive when it comes to choosing an entertainer. I mean what if someone I hadn't met or heard of is just strange or weird, and speaks a whole chunk of terrible English to the kids?!! Worst, a bunch of acts that he doesn't know what he's doing! I checked him out, tried searching for reviews and videos of his performance. It was not with much convincing avail, but I was affirmed of my choice because of a credible show he did with channel 8 last year. Mentoring a little magician wannabe. Moreover, it can't be too bad relating to kids when he's a primary school educator, with 20 over years of experience with little kids. Sounding like one who's rich in age. I don't know how old he is, but for sure, he looks young. Ok, he sponsored his service at our party, but I wasn't contracted to say this. Regardless of age, through our correspondences and conversations, I could sense his strong passion for kids and magic. He's one many of our guests commented that their kids love his magic show! Parents were raving about him too. That was truly the highlight of the party. Jason was magically hilarious! So funny that he had all the kids in stitches. I will say where there's children laughter, there's contented joy. Jason brought with him partners for performance. We met his puppet, Dusty and woah... a live dove! It flew out when Jazz popped a balloon. The kids were very excited to get close for a touch. Pop! And a bird appeared! It was a bonus to have comedy weaved into magic. A magical surprise indeed! We took up package A (45 mins of balloon sculpting + 30 mins of magic show) with him and I had never think Jack can be a master of all trades. 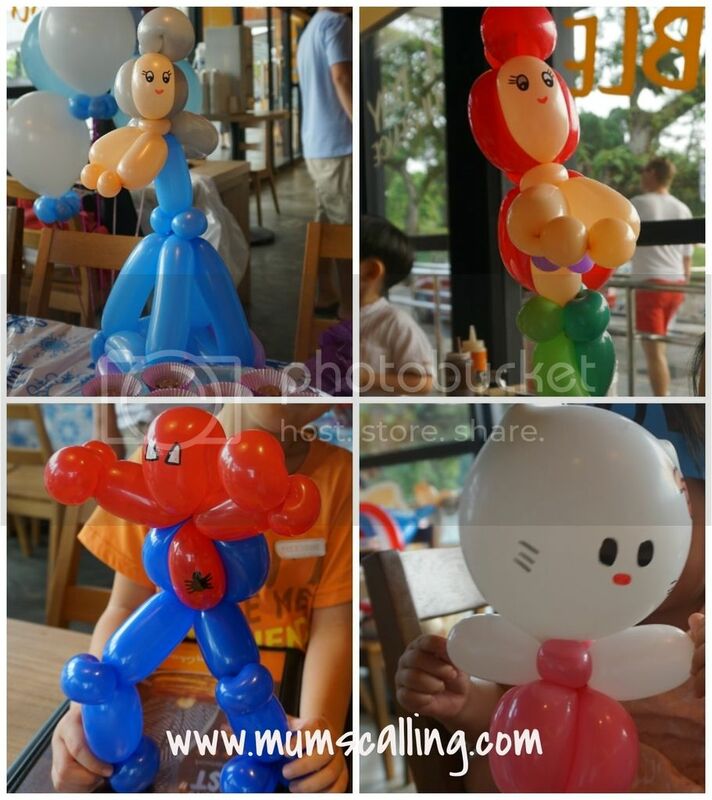 He does have some good skills at balloon sculpting too. Like his magic show, it was no nonsense. And if he can't figure it out, he will be real honest about it. And he actually made sure all kids had a sculpted balloon to bring home that day. One thing about Jason, he is sure an early bird. He came in even before we, the hosts arrived, and I was suppose to be early for deco do up. It's good assurance that he will not be late for his allocated show time. I also read that he had performed and worked with various charitable organisations to spice up little children from all walks of life. It's so true when we say it's more blessed to give than to receive. May his magical career be richly rewarded. So yeap, we're extremely thankful to have him making the party extra lively and joyous. Our only regret was not being able to buy him a drink and do a sit down meal with him that day. He had to rush off to another event. Heartfelt thanks, Jason! We then ended the party with a surprise appearance, Olaf! Under my appeal, my brother was 'forced' to sacrifice his service behind that resilient fabric. Warm and stuffy, but glad he survived to make some kids happy. Thanks Mummy Ang for the loan! So glad that Jazz's party happenED! Read past tense. After a series of postponement, she finally made it to blow the candles and distribute her party packs. I had ordered a loot of goodies from taobao to fill the party packs. It took me days to navigate how to finally check out from taobao. Glad my orders arrived! Stampers and pencils from oriental trading. For some reasons, I find it always challenging to get nice lovely stuff from our local party stores. Either they are rather impractical or super expensive. Always prefer hunting more diligently for these, if possible. Planning early helps. Goodie bags are lovely props to thank little friends for coming. It has to delight. Ordered watches and combs for the girls. We know vanity kicks it at this age and a watch will give them good cue to recess time next year. Inexpensive may not come with quality, but I do hope the watch can withstand time. At least till their first official recess time next year. I added hand made hair clips to the girls' pack. Ribbons from taobao too. Quite an effort, so please tell me the handmade look great. Segmented Olaf were for the boys. It can be easily assembled with the attached velcro. Jare had this as a gift some time ago, it got him crazily happy. I thought it makes good gift for the boys this time. It's a relieve to me. I'm most rewarded when the children and guests, whom I'm also trying to please are happy. We know it's not an easy commitment for families to make time for parties. Thank you snow much for coming by, big and little friends! Your presence made her party so complete. Jazz was so happy, she thanked me profusely for the work done, money spent and bringing in her abracadabra magician dream. Once again, Happy Birthday, Jazz! Yes, your party came true. You've been so patient for this day. Thank you for waiting. Disclaimer: Glitter artist and magician were sponsored for reviewing purpose. All photos and opinions are solely ours. 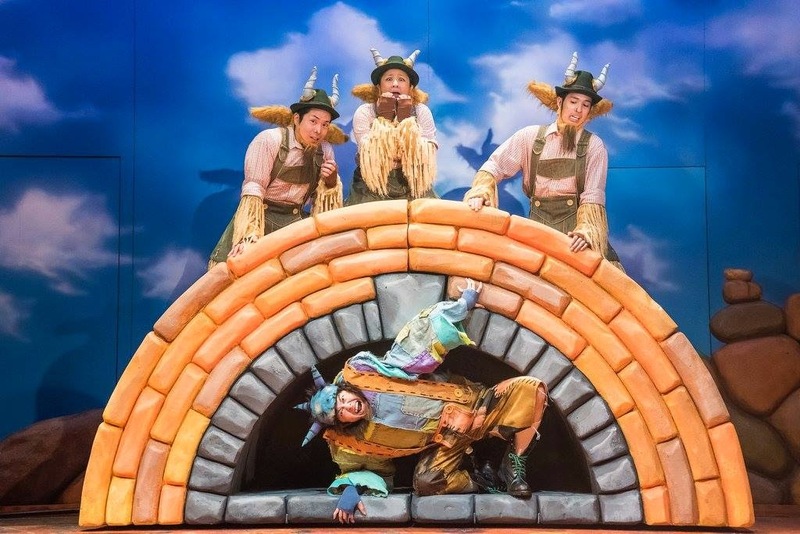 It's another excellent production by the Singapore Repertory Theatre (SRT) - The Three Billy Goats Gruff! An all time favourite classic tale weaved into a kids' musical! This production has been creatively spun off from its original tale. The goats and troll remain, but with a refreshing taste that you'll love. The Three Billy Goats, affectionately known as "Baby" "Middle" and "Big" were put to test by a bout of horrible drought. The grounds have turned to a dreadful shade of brown. The goats are slowly but surely running out of food. Together with their caretaker, Little Bo-Frilly, the gang made a decision to cross a bridge to the other side of the valley, where lush green grass awaits. The challenge was what lay beneath the bridge, a frightening troll that loves to feast on goats! Glup. We like to always say that the grass is greener on the other side of the fence. Little did the goats know that the grass they've been longingly gazing from afar, had been beautifully painted green by the mean sly troll! It was most interesting to watch how the goats outsmart the monstrous, greedy troll in this fight for survival. After much effort and encounters, the goats had learned the important lessons of contentment and patience. Be contented with what they have and be patient for the drought to be over. While they survived on oats. It's not just a goats' thing. Similar to a person's life, we should exhibit contentment and patience in the hardest moment of life. The values exemplified are very relevant learning and teaching points. Love the morals weaved into this play. This highly interactive musical did not disappoint with its meaningful storyline and catchy songs. Not available in its CD yet, I heard. This seems to contain more educational elements than the previous few productions. It mentioned and explained the term herbivore and that goats are herbivorous animals. It talked about weather forecast being something predicted, not on weather that had come to past. Always a nice way to introduce and refresh the kids' vocabulary. Definitely what parents love looking out for in kids' musicals. We had also specially like the role of the troll. Talentedly acted and well expressed with its shaggy outfit, hunched back and husky voice. The role of the menace is always uniquely noticeable. Js were more than once frightened by its unexpected appearance, but that didn't deter them from giving it thumbs up! Don't forget to admire the stage prop (Boulders) with creativty and imagination when you are in the theatre. And of course, find out too, the fate of this mean troll. This must watch musical is recommended for children between ages 2 to 6, and will run till 10 May 2015. Get your tickets from sistic. Or if you plan to catch the upcoming shows by SRT, you may get the season pass for a more valued deal of 20% discount. A little piece of good news is that, with thanks to SRT, we have a pair of The Three Billy Goats Gruff tickets for giveaway. Giveaway pair is allocated only for the 18th Apr (Sat), 11am show. 3. Like and Leave your email address on this Facebook post. Tag a friend or more whom you think will love this theatre play! 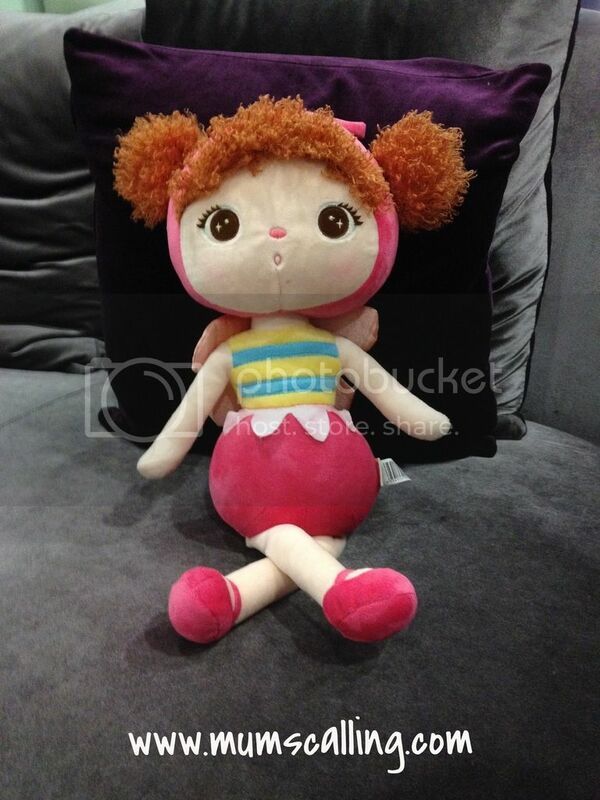 Giveaway ends on 15 Apr 15, 11:59pm. Best of luck! Disclaimer: We were given complimentary tickets for the purpose of this review. All opinions are solely ours. Some weeks ago, we received a box of sensory play and a toolkit from my messy box. A box of play tools and materials targeted at kids between ages 3 to 6. It is one sensory play experienced at the comfort of our home. One that I'll always appreciate when we're coop indoor. This is not just an opportunity for observation and manipulation through hands on learning experience, it is also a great way for children to engage their senses through meaningful play and discovery. Best thing, with all materials provided in one box. Active play was created to learn through small world of dramatic play. In our pack, we were given some wooden monsters blocks for drama play. Js role played, imagined, expressed and narrated anything they had like on those monsters. They even gave them nick names. We went from stories to funny sounds and to interesting expressions. It was just too comical listening to their stories and watching their faces change with their lines. They went so crazy with the stories, rattled on about space, aliens and planets with monsters. 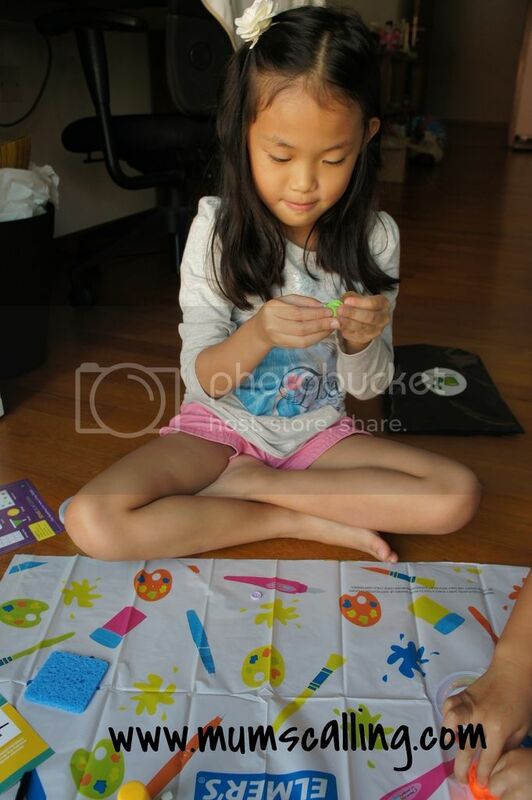 Creative play was created to learn through art and designed. That was where Js had their most fun on with those crafty hands. They love hands on crafty projects. We were given materials and tasked to make monsters to our imagination. Indeed, where there's creativity, there should be no boundary. I told them to get as wild as they could. I love the props given, they initiated crazy ideas and hint the creation of some unusual monsters. It was hilarious looking at our end creations. I had my hand in one of the monsters too. No prize for guessing that right. Explorative play was created to learn through dry and wet play. We were give some corn nuggets for exploration. These corn nuggets get sticky and sticks when dapped with water. It's an interesting play and creation that does sticky magic with the absence of glue. We know most kids are drawn to natural materials like sand, water or textured materials like beans or rice. It motivates them to enjoy play with a tactile experience. I thought Js didn't get quite creative with this, but still a very nice effort. Process more important than results after all. Everything was much uninstructed free play. They lead their own projects, while I only prompted ideas for adoption. It took us slightly more than an hour to complete all. There was immense satisfaction for doing this with them. It was some play, discovery and learning in their 'don't know what to do time.' Least they were engaged meaningfully. The toolkit (translucent box) comes free with a 6 or 12 months subscription. In it comes with specially sourced tools to aid extended play and learning possibilities. In the toolkit, we found a useful prop to prevent spills and stains on our floor, a table cover that I used as floor cover. There was an apron too. Thoughtful inputs that Mummies will love. For the theme month we received, I do think that the materials are fairly used and well distributed among Js. No wrestle over it. You may however consider adding an extra $10 per month for the six or twelve months subscription, for added sibling materials. My messy box's monthly subscription is priced at $34. Six months subscription at $192 (save $12) and twelve months subscription at $360 (save $48). There are different themes every month, so every box will be refreshingly new and good! For readers of Mum's calling, you may subscribe to these boxes at a 5% discount. Just quote 'mumscalling5' when you check out from the store. While you are contemplating to get these into your mailbox. Here's one giveaway box for you to try your luck on. Big thanks to the nice people from My Messy Box. 3. Leave your email address on this Facebook post and tag a friend or more whom you think will love this giveaway! Yeap, just these easy steps to fulfill. Best of luck! Oh, you may also sign up for their mailing list on their website to receive free reward charts. I think it's pretty useful. This giveaway has closed. Thank you everyone, for your participation! A final keeper had been picked with random.org. Congrats Sandra T! Disclaimer: We were given a messy box for the purpose of this review. All opinions and photos are solely ours. You've turned wonderfully 6! You're growing, almost and so quickly to the fine young lady I had imagined you to be. Most memorably on this sixth, I know you had a blast. I baked some cuppies for your celebration in school and you were extremely delighted to have me coming in to party with your teachers and classmates. It wasn't an exuberant, extremely tasty or creatively designed cake. It was simply homemade and that got you overjoyed. After which, you distributed goodie bags before calling it her day at school. As we walked out, you said that was your best day ever. You taught me simple joy. It was also a day I spent exclusively with you. Not one I did with your little brother on his birthday and not even a school celebration for him. We do owe him one. You had the privilege of half day school before we retreated together to Universal Studio for theme park fun. Hot and searing the weather may be, we were glad that it wasn't rain we were battling with. That became a secret between you and me. Jare didn't know what went under our sleeves till we presented him a little souvenir from our trip that evening. Daddy wished to be there, but he had to be at work. We agreed that he will make it up to little brother. Thank you for a fun filled day! I was very much looking forward to bring you out, just us. While you have a younger sibling, favoritism isn't something we struggle with. Just that most days, Jare is like a natural magnet to me, and you, a natural magnet to your Daddy. Many occasions, I was hindered to get quality time with you when Jare was around. Birthday is definitely one good reason to magnify my attention for you. We went on rides, did shows, took pictures and walked happily hand in hand. It's always more manageable bringing only one out. We enjoyed time together like a friend, more than a parent and child. It was awesome quality time! A celebration in school, half day at the theme park, a dinner with your favourite Da Jiu and an evening surprise by your friend who came by with cuppies to sing you a birthday song got you so over the moon! I will say, friends since your infant days are keepers! Thank you, Lees! I will remember that evening, I baked you a cake too. It was over baked and tasted almost terrible. Still you were wow-ed by the 3 coloured layers, which I lazily replicated a 7 coloured rainbow cake. Despite my sluggish and overlooked effort, you said it was beautifully and tastily good. You were so kind in your words. Thank you for a wonderful day with you, to rediscover and love you all over again! So now you are 6. In the preceding years, I saw how you grew gradually into a girl. The chubbiness on your face faded with time. Instead of becoming more adorable, you grew beautiful in our eyes. We know, no one's perfect. You do have some funny and annoying habits, but I'm sure you'll outgrow them in no time. You cared for us and your little brother with a good sense of maturity. You never fail to write us little notes to cheer us up when we're down or unwell. You are a good encourager. Your style of big sister leadership may not be to your brother's liking at times, but we know how you like to be firm on your judgements and plans. We always tease that you'll be a CEO some day. We often talk about the kind and bad tree, and we know your heart is rooted to be kind. Remember, good values will not lead you to wrong decisions. It may be tough decisions, but don't give up for a good cause. As you mature and grow, build up that boldness. Not the boldness that keeps you climbing and swinging high up on the trapeze, but the boldness to make your feelings and desires known to people around you. In a subtle and reasonable manner. Holding reservations may often obstruct your door to opportunities and getting what you had really want. As you start venturing deep into society, excel better discernment between the meek and menace. Stay on the safe and righteous side, and be bold to say 'No' at the right time. Have courage, my darling. Thank you for being our wonderful and sweet daughter. Happy 6th Birthday! You are our joy, light and our pride. May you stay healthy, blessed, God loving and richly loved. As you grow in age, may you also be showered with tremendous wisdom and knowledge in the many studious years ahead. We love you!